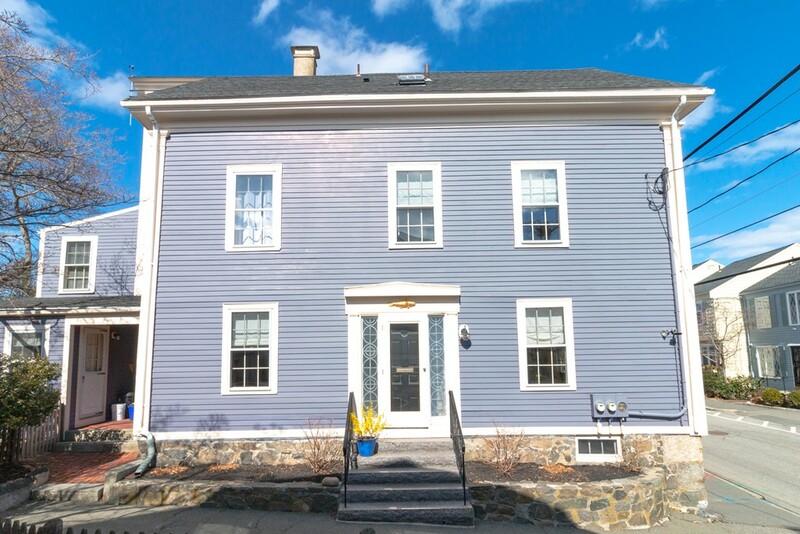 Antique Colonial in the heart of Old Town just across the street from Marblehead Harbor! Historic charm and period detail meet modern amenities throughout this grand home. The open first floor is perfect for entertaining or with room for the whole family. Beamed ceilings have recessed lighting and built in speakers and the gleaming pine floors reflect the sun from huge windows with custom shades. A cherry wet bar w/wine cooler completes the large family area leading to the formal dining room and on to the glassed pantry. A Cathedral ceiling graces the spacious kitchen with granite/SS finishes, an eat-in area and French doors opening to a brick patio and fenced yard. Two bedroom suites each with full baths have many options with separate sitting room/home office or additional bedroom. Large AuPair/In Law Suite with living room, eat in kitchen & two BRs is a surprise bonus! Gracious living near everything Marblehead!